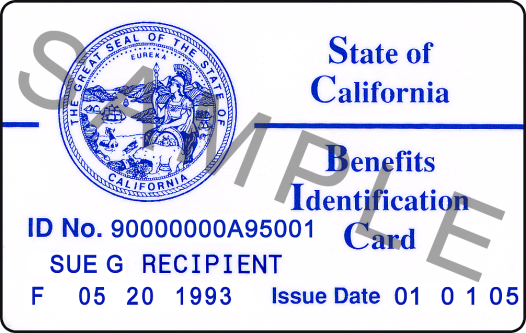 The old and current card for existing California Medi-Cal recipients. Never, ever, give Riverside County Medi-Cal Social Services in Hemet, California any piece of paper without getting a receipt for it. Never, ever mail anything to Riverside County Medi-Cal Social Services in Hemet, California. They will claim they never received it. Failure to follow this advice will give you immeasurable grief (based on personal experience). They reneged on everything and never bothered to tell you. They messed up, discovered their error, messed up again when semi-fixing it, and then tried to cover it up instead of warning you about it. By the time you discover it, it's too late to request a State Hearing to get the rest of it cleaned up. On other occasions, they've sent me ultimatums with due dates earlier than when they sent out the letter. Then you discover your Medi-Cal insurance and/or QMB have been cancelled; again without any notification or warning whatsoever. Be advised that once you have the Medi-Cal mess straightened out; Medi-Call apparently doesn't tell the subsidiary plans that things have been fixed, IEHP being an example. You have to call IEHP or whoever and get it straightened out on your own. Also, if you had Denti-Cal; you may have lost that as well. These are not isolated occurrences. These incidents have been going on for years. Even though fixed, the Hemet Medi-Cal office will still pass along the original false information on to the State of California. State of California then automatically passes along the false information to Social Security. This includes the withholding of the QMB payment from Social Security. Chaos will then automatically ensue as to my monthly Social Security retirement benefits amount re QMB and such. Last time this happened, it took 1-2 months before it hit; slow pipeline apparently. Then it eventually gets mostly fixed within another 2-3 months, again the slow pipeline issue. The last time, some money was permanently lost, as in gone forever. This was because of the previously mentioned no-warning issue. This time, I know it's coming; so I may be able to recover all of it. It's probably going to be a lost cause, but I will call social Security and warn them what is coming down the pike. It's a long shot, but maybe they have the capability to be prepared and abort the sequence before or when it happens. We shall see. Am not hopeful. I'll post updates as they happen. I've also fired off an email to the relevant California State site. Here's a list of Federal/State sites that might actually help you. 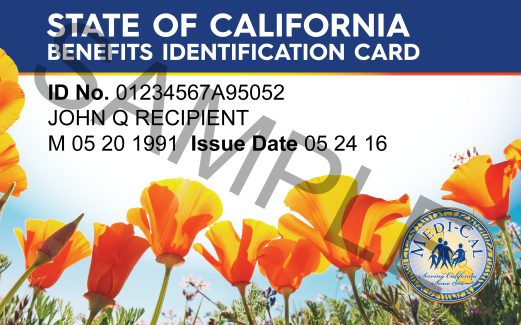 The new and current card for new and existing California Medi-Cal recipients. A side note. You will need one of the above cards when you go to Hemet Social Services Medi-Cal office to submit your paperwork at the imaging kiosk. When you use the kiosk, it will automatically give you a receipt. [update] Have now been told via other comments case number is enough. I frelling HATE bureaucracies! When I am talking to people, and state a method I feel would work better, they are inclined to say, "It isn't that simple!" I tell them, "Yes, it IS just that simple! It takes a LOT of hard work to make things this complicated and difficult!" KISS principle, people, KISS principle!